SEP. 7TH 1914. AGE 14. Augustine Margetts Kearsey was born at Hailey near Witney in 1865 and baptised at Ramsden on 1 October. He was the son of Richard Kearsey (born in Minchinhampton, Gloucestershire in 1819) and his second wife Agnes Sarah Day (born in St Ebbe’s, Oxford in 1834). Augustine’s father Richard Kearsey had married his first wife, Jane Rouse, at Barcheston parish church in Warwickshire near the beginning of 1846, and in 1849 they had emigrated to Canada with their two sons Richard Vincent Kearsey and Thomas Kearsey. Two more children were born in Canada: Jane Elizabeth Kearsey and Annie Kearsey. Richard leased land in Ontario, but the enterprise appears to have been very difficult, and in about 1856 he returned to England alone as a widower. On 14 December 1857 at St Ebbe’s Church Richard Kearsey married his second wife, Agnes Sarah Day, the daughter of a tailor of Blackfriars Road: he was described as a farm bailiff of Orchard Street. Agnes was the granddaughter of Philip Margetts, the Master of the Bluecoat Charity School in St Ebbe’s, and in 1851 she and her mother and sisters were living with him: this explains Augustine’s middle name. At the time of the 1871 census Augustine (5) was living at Ramsden with his mother Agnes (35), who was described both as married and the head of the household, and his siblings Charles (12), Archibald (10), Edward (7), Francis (3), and Mary (1). His father Richard Kearsey, an agricultural labourer appears to have left his wife, and was lodging at Marske-by-the-Sea in Yorkshire: by 1881 he had returned alone to Canada, and in that census Agnes (45) had reverted to her maiden name, Day, and described herself as single and a former dressmaker: she was then living at Witney Road, Hanborough with with Edward (17), who was a shepherd, Augustine (15), who was an agricultural labourer, and Francis (13), who was still at school. 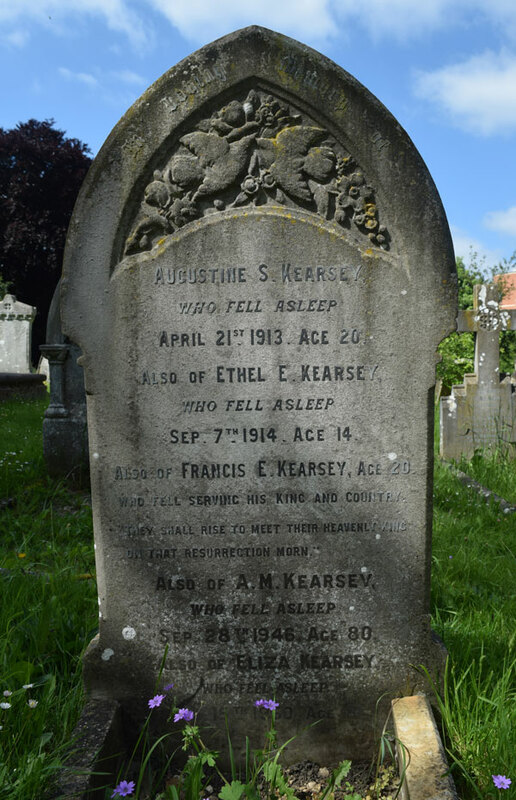 Augustine’s mother Agnes Kearsey died in the Headington registration district in the third quarter of 1886 when she was about 50, and her maiden name Day was given on her death certificate: she was buried in Eynsham on 25 September 1886. Eliza Russell was born at Eynsham in 1868 and baptised there on 5 July, the daughter of the labourer Richard Russell and Emma Brayne, who were married at Eynsham on 10 July 1864. At the time of the 1871 census Eliza (2) was living in the High Street, Eynsham with her father Richard (34), her mother Emma (35), and her older brother Samuel (6). By 1881 Eliza’s father had died, and her mother Emma was a shopkeeper living in Queen Street, Eynsham with three children: Samuel (16) was a grocer’s porter; and Eliza herself (12) and Richard (4) were at school. Eliza was still living with her mother in Eynsham in 1891, and was then working as a paper sorter at the mill there. Frederick Margetts Kearsey (born in Oxford on 16 October 1909 and baptised at St Barnabas’s Church on 16 December). Augustine Kearsey and his wife settled in Oxford after their marriage, moving to the Jericho area between 1892 and 1895. Augustine was described as a groom in the parish registers between 1895 and 1898. By the time of the 1901 census Augustine Kearsey (35), who had now become a furniture dealer, was living at 4 Albert Street, Jericho with his wife Eliza (32) and their first four children. By 1911 the Kearsey family was occupying both 4 and 5 Albert Street, and Augustine’s wife and son Augustine junior were assisting in the business. Their youngest six children ranging in age from one to twelve were at home, but Louisa (16) has left home and was working as a servant in the boarding house at 163 Walton Street. Augustine’s father Richard Kearsey died in Guelph, Ontario at the age of 95 in 1912. † Augustine St Clare Kearsey died at 5 Albert Street at the age of 20 in April 1913 and was buried at St Sepulchre’s Cemetery on 24 April (burial recorded in the parish register of St Barnabas’s Church). † Ethel Eliza Kearsey died at 5 Albert Street at the age of 14 in September 1914 and was buried at St Sepulchre’s Cemetery on 10 September (burial recorded in the parish register of St Barnabas’s Church). On 1 January 1915 at St Aldate's Church, Oxford, Louisa Agnes Kearsey (19) of 4 & 5 Albert Street married Clarence Trafford (21), described as a tailor of Christ Church, the son of the stone sawyer Frederick Trafford. Their second son Francis died in 1918 in the First World War. Their second son Francis served as a Private in the 2nd Battalion of the Border Regiment (Service No. 29180) in the First World War. He died in Italy the month before his twentieth birthday on 9 August 1918, and has no known grave. He is remembered on the Giavera Memorial and also on the St Barnabas’s Church war memorial (above right). CWGC page. In the 1920s Augustine Margetts Kearsey was living at The Retreat, Littlemore. In the third quarter of 1934 in the Witney district, Frederick Margetts Kearsey married Alice Phipps. By 1945 Augustine had retired to 113 Upper Road, Kennington, Berkshire, and his sons William Charles Kearsey and Frederick Margetts Kearsey ran the business in Jericho. † Mrs Eliza Kearsey, née Russell died at 47 Walton Street at the age of 81 on 15 January 1950 and was buried in St Sepulchre's Cemetery on 18 January (burial recorded in the parish register of St Matthew's Church, Grandpont). The St Matthew's register clearly states that she was buried in St Sepulchre's Cemetery, which had now been closed for new burials. Her effects came to £1,117 12s. 1s. 1d., and probate was granted to her son William. Louisa Agnes Kearsey, Mrs Trafford (born 1895) and her husband Clarence Trafford had no children, but adopted a son. She was living at 126 Oxford Road, Littlemore when she died at the Radcliffe Infirmary on 4 November 1936 at the age of 61. Her effects came to £4,153 14s. 5d., and her executor was her husband Clarence, who was described as a china-packer. William Charles Kearsey (born 1902) and his wife Constance were living at 12 St Barnabas Street, Jericho in 1949. William died at 343 Iffley Road on 1 December 1962. His effects came to £26,098 6s., and his son Francis, described as a motor mechanic, was his executor. Elizabeth Kate Kearsey (born 1905) never married. She was living at 47 Walton Street in 1949. She died on 12 February 1962 at 96 Fairacres Road, but her address at death was actually 49 Aston Street. Her effects came to £26,015 17s. 6d., and her executor was her brother William. Edith Eleanor Kearsey, Mrs Partlett (born 1907) and her husband Frederick had a daughter Joan I. Partlett, who was born in the Headington district in 1931, and Sheila Partlett, born in the Abingdon district in 1945. They were living at 69 Fairacres Road by 1949: Edith died at that address in 1995 and her husband at a nursing home in Cadnam, Hampshire in 1996, and their ashes are interred at Iffley churchyard. Frederick Margetts Kearsey (born 1909): his wife Alice Kearsey died in the Witney district near the end of 1962, and he died in Oxford on 1 January 1986..
NOTICE is hereby given that the Partnership heretofore subsisting between us, the undersigned, Augustine Margetts Kearsey, William Charles Kearsey and Frederick Margetts Kearsey, carrying on business as Furniture Dealers, at 4 and 5, Albert Street, and 57, Nelson Street, Jericho, Oxford, under the style or firm of A. M. KEARSEY & SONS, has been dissolved by mutual consent as from the tenth day of April, 1934. All debts due and owing to or by the late firm will be respectively received and paid by the said Augustine Margetts Kearsey and William Charles Kearsey. The said business will be carried on in the future by the said Augustine Margetts Kearsey and William Charles Kearsey alone. The business was advertised as “Kearsey A. M. & Son, 4 Albert st. & 46A Wellington st. Jericho” in Kelly’s Directory for 1936. By 1945 the business had moved to 47 Walton Street. Its last listing in Kelly’s Directory was in 1956.